Two or three times a week my kitchen turns into juicing central. I love juicing so much that in the two and a half months that I own a juicer I must have made at least 40 juices. Making juices is a lot of work but it's also lots of fun, and recently it became my new creative outlet. The first few juices I made were based on recipes from juicing books, but quickly I decided to start inventing my own recipes, as the ones from the books were too complicated and not as tasty. Moreover, an apple is not equal to an apple, so one needs to modify the recipes "on-the-go," based on the taste of the components. 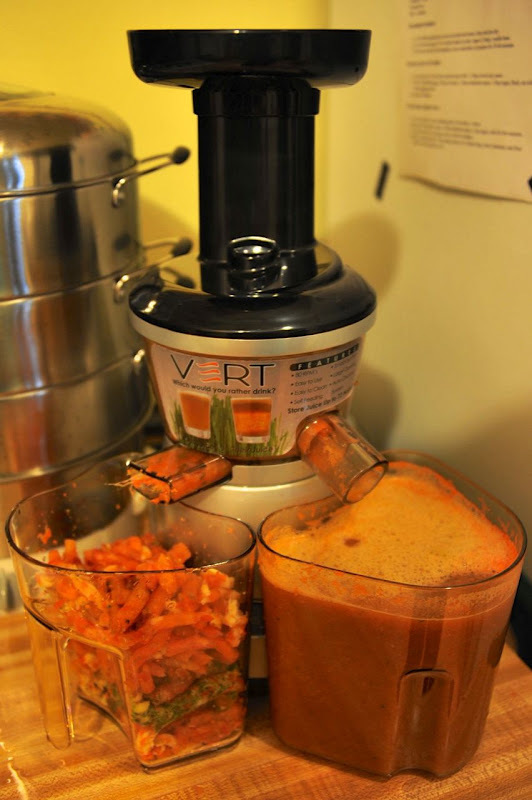 My favorite juicing vegetable is the carrot, as it has lots of vitamins and very refreshing taste. 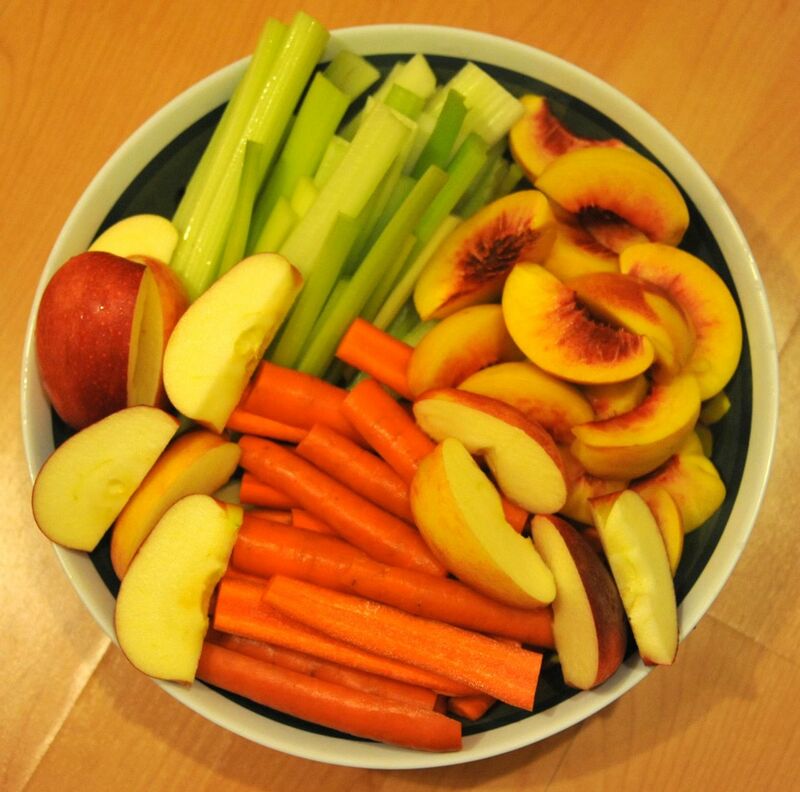 For variety, I usually mix it with some other vegetables or fruits, such as celery, apple, pear, peach. 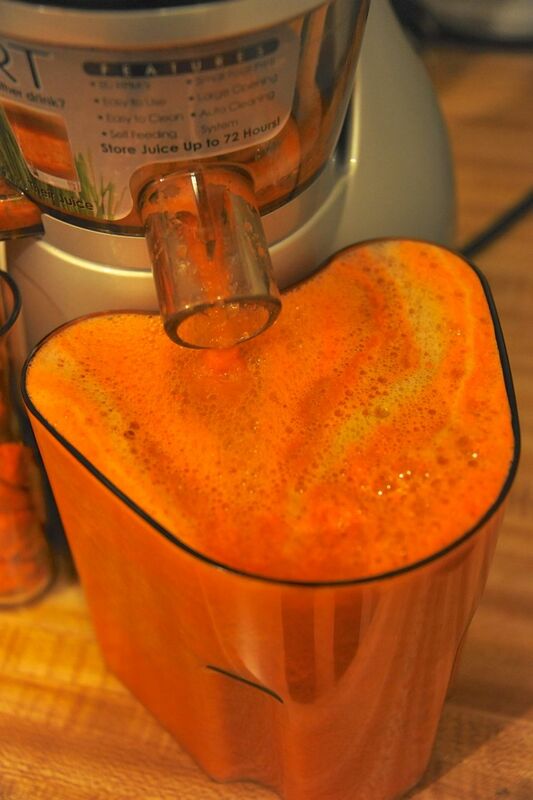 Six large carrots, two heads of celery, two apples, and three peaches make one delicious juice. This amount of fruits and vegetables makes about 1.5 liters of juice. Notice the ratio between the juice and leftover pulp. So fresh, so healthy, so tasty! 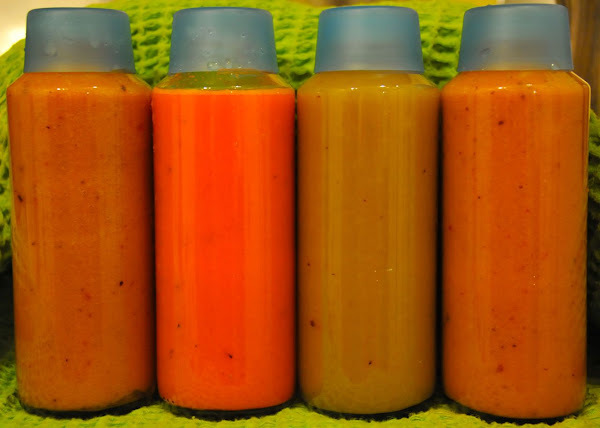 The end product: Carrot Celery Apple Peach Juice. And here are ingredients of a very refreshing Tomato Lemon Juice. 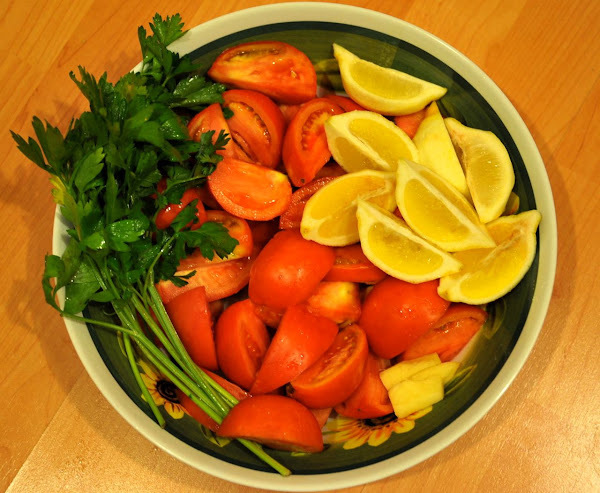 Six tomatoes, two lemons (skins and seeds removed), a bunch of parsley. Juicing six medium-size tomatoes and two lemons results in 1.5 liter of Tomato Lemon Juice and very little pulp leftover. Three pounds of ripe peaches make slightly more than a liter of Peach Juice. Four pounds of grapes make slightly more than a liter of very dense and extremely sweet Grape Juice. Grape Juice: Notice the ratio of juice to the pulp! One unexpected but highly welcomed side-effect of juicing is that my husband loves drinking juices and even participates in making them. We're talking here about a guy who would only eat any raw fruits/veggies if handed to him pre-washed and pre-cut! So thanks to my juicer I finally found an easy way to make sure he gets enough vitamins and other micronutrients. 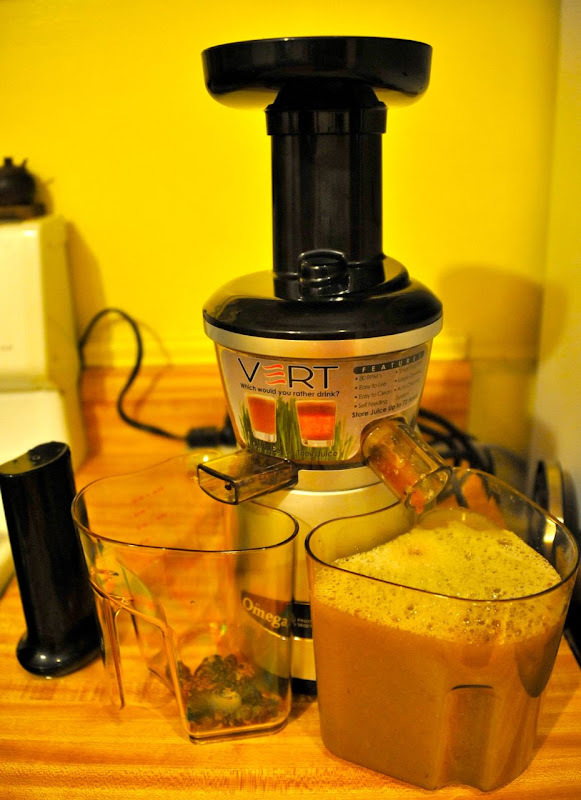 If you have a trouble feeding enough fresh fruits and/or veggies to your family, now you know what to do–get a juicer! It's my favorite kitchen equipment and I'm truly in love with it. However, before you buy a juicer, do a lot of research, as there are many types of juicers, and your research might lead you in various directions. My research led to me to a masticating juicer, as the masticating juicers cause less oxidation than other types of juicers, and therefore are better at preserving the nutrients and freshness of the juices. Masticating juicers also much more quiet than, e.g., centrifugal juicers. For me that was very important, as I just couldn't imagine wanting to use a noisy device on a regular bases. Well, I can tell you that I made a right call there. 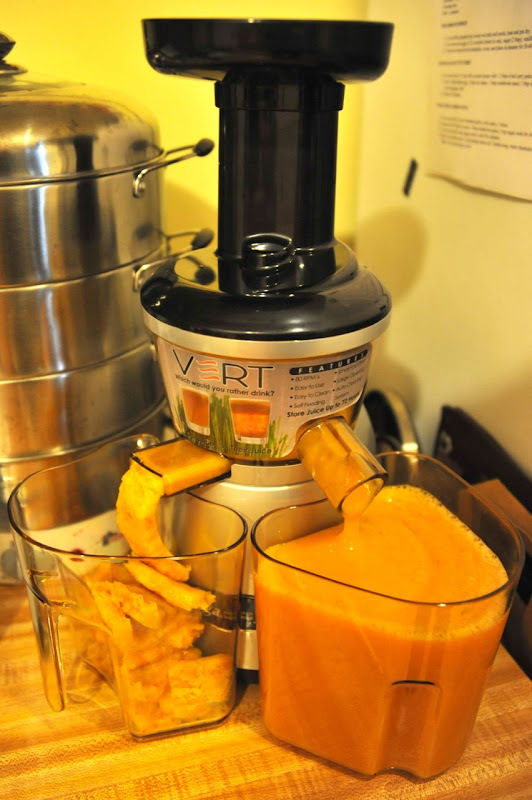 My masticating juicer–Omega VRT350HD–is indeed super-quite. My husband and I can talk and juice at the same time! Another argument for choosing a masticating juicer over centrifugal is that they are easier to clean and I can attest to that. Cleaning and assembling my Omega is a breeze. Some people, however, prefer centrifugal juicers (such as Breville 800 JEXL Fountain Elite, which I also seriously considered), as they use higher speeds, which makes them faster at juicing. They're also able to take bigger pieces of produce, almost completely eliminating the need for pre-cutting anything that will be fed into a juicer. Before I tried my Omega juicer, I was concerned that it might be really slow. Still, because of its all other benefits I decided to take a chance on it. I'm so glad that I did! As soon as I made my first bottle of juice all my worries disappeared. It's possible that Omega is slower than centrifugal juicers, but it's still fast enough: it can make 1.5 liter of juice in under five minutes. In case you wonder, the most time-consuming step in juice-making is cleaning the fruits and veggies before feeing them into a juicer, but that would be the same for all juicer types. 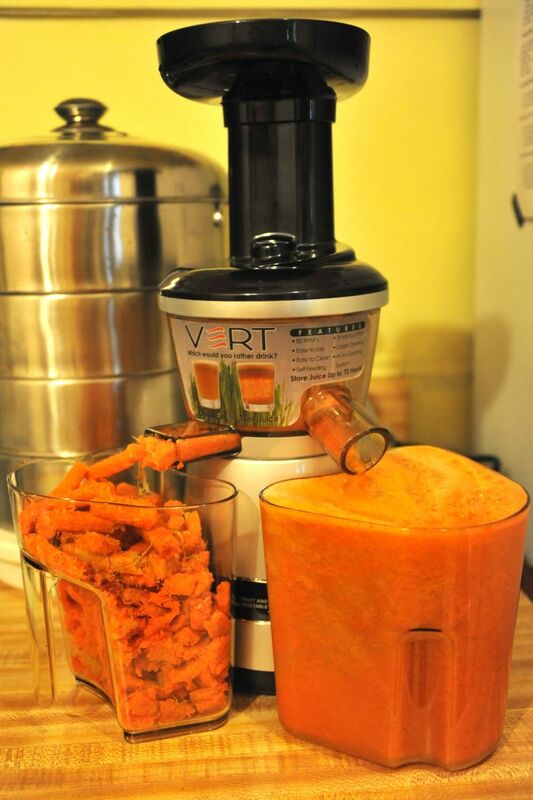 As a word of caution, Omega VRT350HD allows for quite a lot of pulp to get into juice. My husband and I actually like it that way, but if you don't like pulp in your juice, you should look for another juicer (maybe Omega J8004? ).